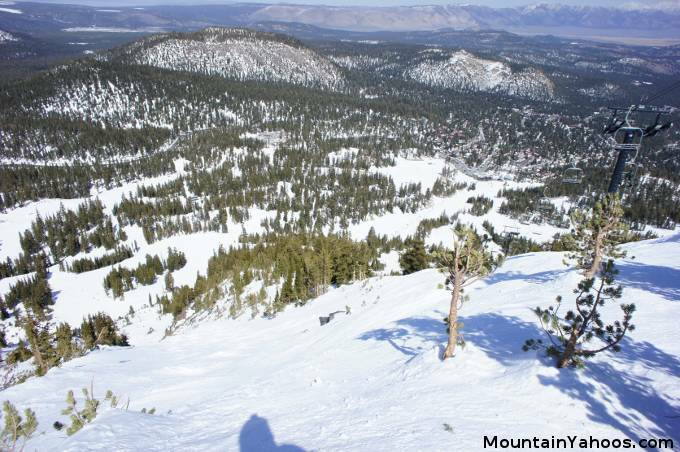 The terrain at Mammoth Mountain off of chair lift 22 is some of the steepest and most challenging terrain anywhere. There are three chutes appropriately numbered Avalanche Chute I, II and III or nicknamed "Avi I", "Avi II" and "Avi III" (probably not an affectionate nickname but a practical one). 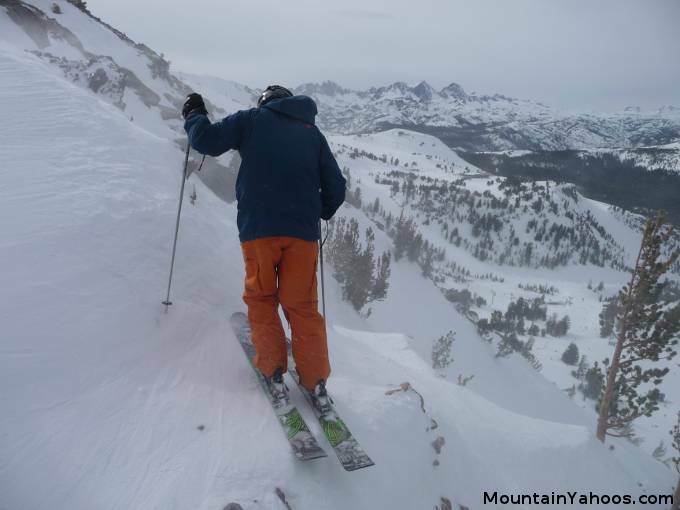 The easy way down the chute face of the peak is on runs Viva, Shaft and Grizzly which are also rated "Double Black Diamond" but still less severe. Your only chance at an easy way off of the peak of Lincoln (top of lift 22) is to go straight off of the lift to the blue run "Solitude". 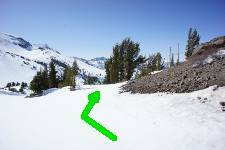 The Avalanche Chutes are in-bounds and do not pose an avalanche danger, it is just the name, the real fear is the grade of their incline. WARNING!!! 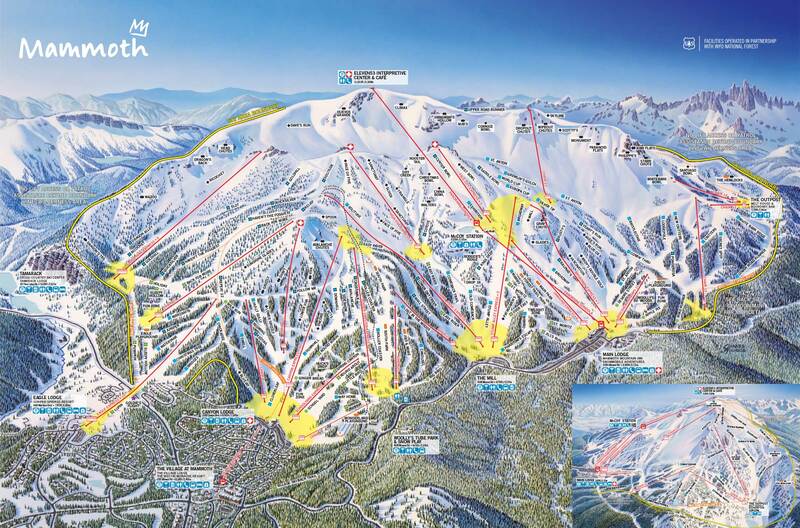 : Don't ski the Avalanche Chutes unless you are an advanced skier. A typical run of either Avi chute 1, 2 or 3 is followed by the cat track "Follow Me" to the "The Acts". This will lead to the blue cruiser "Downhill" which will take you back to the base of chair 22. Take this lift to the top to do it all over again. Avalanche Chute One is the least known as most skiers do not know how to get to the entrance. This is often a bonus on a powder day after much of the mountain has been tracked up. 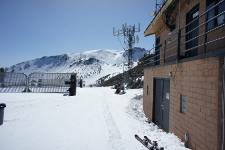 At the top of lift 22 proceed straight past the Ski Patrol hut and look for the entrance on your right. Follow the edge of the fence line to the entrance of "Avi I". If snow coverage is limited, you will have to remove your skis and walk over the rocks. 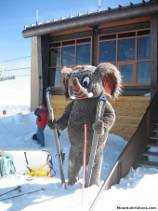 Actually this is an extra bonus as it will be a deterrent and save the powder stash for your arrival. Entrance to Avalanche Chute II at Mammoth Mountain CA. 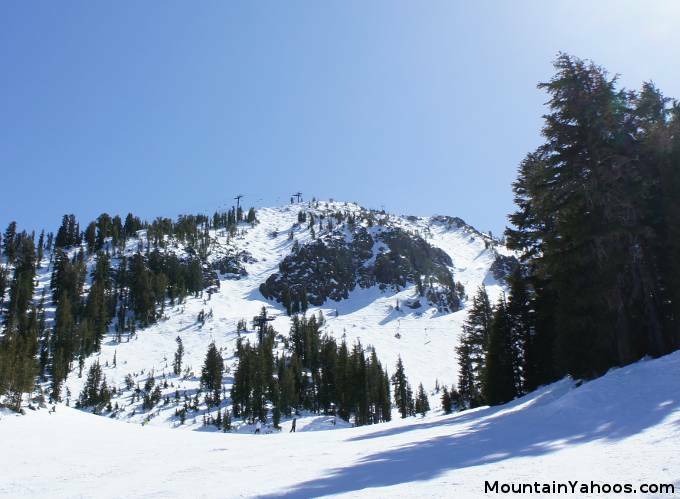 "Avi Two" is the most difficult run on Lincoln Peak and the entrance can be tricky (pay attention - no room for error). 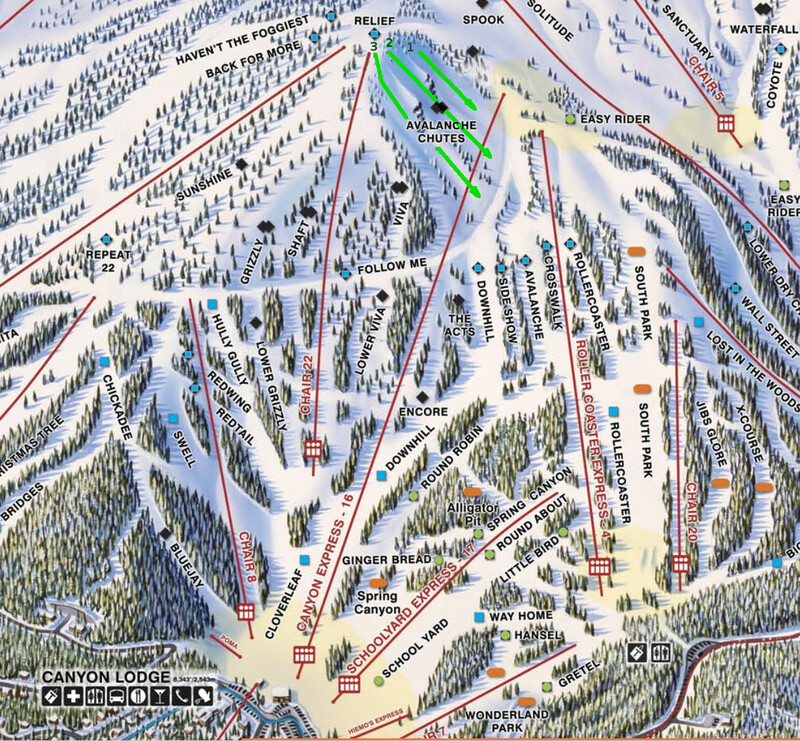 Turn hard right after getting off of lift 22 and you will immediately see the entrance of Avalanche chute II on your left. 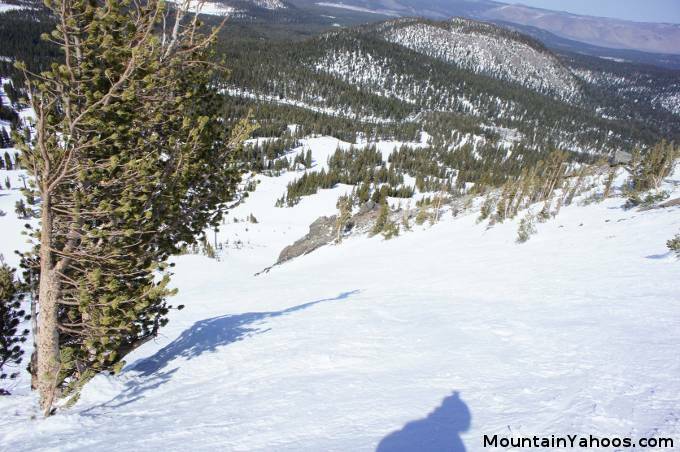 If it doesn't look that steep, descend to a lower vantage point and turn your view around so that you are looking up the run. 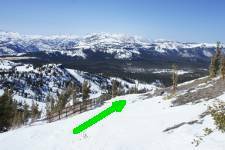 Entrance to Avalanche Chute III at Mammoth Mountain CA. Turn hard right after getting off of lift 22 and follow under the lift until you see the entrance of Avalanche chute on your left.